Roku today officially announced the launch of its new Roku TV, a value-minded line of 1080p smart HDTVs with the Roku streaming video service built in. 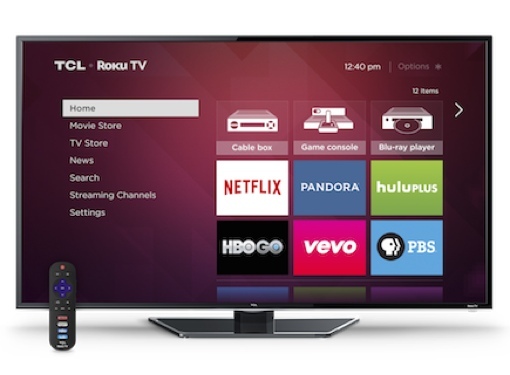 Roku TVs offer a simplified user interface than those found on existing Roku devices. Your favorite shows and movies are automatically located through a one-stop search that operates across streaming services and your pay cable subscription. And if that’s not enough entertainment, the Roku service itself offers over 1,500 channels with over 200,000 movies and TV episodes available for your enjoyment. The smart televisions are being manufactured by Hisense and TCL in sizes ranging between 32 and 55 inches. Prices begin at just $229 for the 32-inch TCL model, and top out at $679.99 for the 55-inch version. Hisense Roku TVs will be available in “major national retailers beginning in late September.” TCL Roku TVs are currently available for pre-order at Amazon.com and are expected to ship in 2 to 3 months. merci de me donner plus d’infos.